Amid the Dixon Place bar's clinking drinks and humming, intimate assembly, bandleader Leah Wells glows with anticipation. 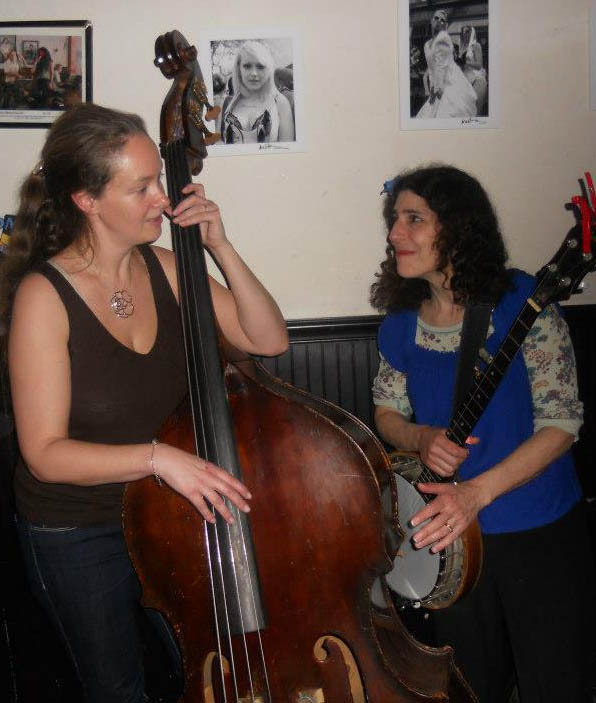 The versatile musician plays guitar, mandolin, banjo, and fiddle in several bands around New York (particularly with We3 in the East Village and The Linemen in the West). But this weekend marked the official debut of her longtime passion project, bluegrass ensemble The Pick Six. In a remarkably diverse set, the seven-member group bridged gaps of time and space to create a rollicking journey through the many faces of bluegrass. Leah admits that one of her favorite things about the band is how it exemplifies bluegrass's contradictory nature. "We are a group that met in a church," she says, "but we take our name from the most ambitious and reckless of horse-racing bets. Bluegrass is the music of heaven and hell. I'm very expressed by it." Between those extremes lies a rainbow of emotions to be shared via melodious storytelling. "What I love about bluegrass," Leah notes, "is the poetry of reaching back and touching other lives and times. Bluegrass comes from the heart. What people were moved by, universal themes, endured and captured a direct audience." The Pick Six's performance touched on every major bluegrass tradition, blending history lesson and variety show with good-natured ease. Songs ranged from the gospel ("Instruments of Your Peace") to the sinner's lament ("The Gambler"), from tales of the railroad ("Steel Rails") to a more contemporary riff on modern joblessness ("Man Can't Live by Bread Alone"). Throughout the evening Leah served as group emcee and tummler, offering commentary on the selections and directing her compatriots to show off their considerable talents on individual instruments. Much of bluegrass's beauty stems from allowing each instrument a chance in the spotlight, a fact The Pick Six uses to great advantage. Violinist Ethan Joseph appears almost to dance with his fiddle, giving vigorous life to the music in an electrifying fusion of man and material. Mary Noecker has the most fantastic facial expressions as she plays her bass in studious concentration; even when she's in splendid harmonic tandem with the rest of the band, it's clear she's mentally ascended to some glorious world of her own. Craig Harwood coaxes some of the sweetest sounds I'd heard in ages from a mandolin, standing in for Dave McKeon. Tripp Henderson accomplishes heroic feats on his harmonica (the sheer control needed to do what he does on that thing is amazing). Instrumentals feature heavily in bluegrass music, and the two The Pick Six performed were among my favorites of the night. "Jerusalem Ridge," for its misleading name, actually refers to legendary musician Bill Monroe's Kentucky home and perfectly captures the carefree, toe-tapping energy of American bluegrass. Still, the Irish lass in me left over from a past life felt more drawn to the Celtic tune "Red-Haired Boy," which spins an achingly lovely fable about a wanderer finding his way in the Emerald Isle. "It was a happier time for homelessness," Leah stated before starting the song. Seductive as the instrumentals may be, The Pick Six finds a wealth of lyrical power in lead singer Mollie McComb and vocalist-guitarist Kyle Sandison. Together they put the "heaven" into bluegrass's heaven and hell: Mollie possesses a stunning angelic lilt that can switch from rapid-fire country patter to sultry jazz tones at the drop of a hat. (Her soulful rendition of "Louise," the so-called prostitute's ballad, is a jaw-dropper when it emerges from that innocent sunshiny face.) Kyle, for his part, sings in a strong, clear narrative voice that hints at the preacher man he's studying to become. His stage presence shows that he was born to lead a flock. It was Kyle, incidentally, who brought The Pick Six together, having asked different colleagues to play gospel music for City Grace Church's weekly tabernacle. God was truly in the details, for while arranging the hymns Leah found herself divinely inspired by the collective: "I was really enchanted and as we were onstage [at the church] I looked around and I said, 'Oh, this is The Pick Six!'" Recounting the group's genesis, she giggles, "I was delighted that people were open to the project, and to the name. It's very bluegrass that we've got gambling and gospel as our muses." According to Leah, although she's well-versed in many stringed instruments, her "spiritual home has always been the banjo. It called to me." Leah's healing hands transform the banjo into an extension of herself, a kind and tender force of good, telling stories all the world wants to hear. Her original compositions take the best twangy licks and flavors from bluegrass's balladeer style and update it for modern ears. In the words of her excellently catchy song, she "makes it look easy." Guided by this capable and loving spirit, The Pick Six looks to have a most vibrant life as a unit. Certainly its members are eager to see what the future brings. "I'm really grateful," Mollie says, "to be working with this community of musicians and really excited to bring bluegrass to the hubbub of the city." But no matter where they're working, the emotional connection to the beat reigns over all. "We're drawn to music that sounds like our own organs," Leah posits, "like our heartbeat. And whatever else we're kenning to we're not even aware of." Dixon Place's attendees were keenly aware of what moved them so -- pure love and joy in music-making. As Leah and The Pick Six blaze their happy trail, we can only hope they'll keep plucking at everyone's heartstrings. They've irrevocably tugged on mine.